View our latest catalogue as an interactive brochure, download the PDF or request a free catalogue to be sent direct to your door! You may be new to pond keeping or your pond may be in its twentieth year, but all of a sudden you might start to notice Blanket Weed invading your pond. Blanket Weed is one of the most common Pondkeeper problems, and unfortunately the cause is not always clear. If left untreated, extreme cases can reduce oxygen levels for fish. We’ve pulled together this trouble shooting list to help you keep your pond crystal clear this summer. If you are preparing to build a new pond and planning to fill it with tap water, you may wish to consider filling it with rainwater instead. Collecting sufficient amounts of rainwater is not always practical but if possible, this could save you a lot of additional work in the future. It is not known why, but rainwater does not attract algae problems in the same way that tap water does. We can only speculate that it is caused by the chemicals that tap water contains. The position of your pond can also influence the growth of algae problems. Ideally you should avoid building your pond in an area where it will be exposed to full sunlight all day. Sunlight can escalate algae growth but it is also important to avoid too many trees with falling leaves (or pine needles). Fallen leaves and debris need to be skimmed from your pond surface regularly as they too can lead to algae problems if left untouched. If you already have an established pond that is receiving more sunlight than expected, then adding water lilies to your pond (so they cover 50 % of the ponds surface) will create the desired shade you need. After experiencing severe algae problems, pond keepers can often resort to a water change in desperation. However, for the same reasons as above, this will only worsen the problem. If you need to perform a water change for other reasons, then using rainwater will help significantly. Testing your water quality regularly will help to detect any spikes in nitrate levels. A high nitrate level can cause algae blooms. Excessive organic debris and fish waist can cause nitrate levels to rise (detailed below). Healthy pond plants can help absorb excess nitrate, so the addition of new pond plants may help if you are experiencing this problem regularly. When decaying plants, fallen leaves and fish waste are left to rot and turn to sludge at the bottom of your pond, excessive nutrients are created and Blanket Weed can break out. We would recommend skimming the surface of your pond for fallen leaves regularly during summer months, and then using a fixed net during the autumn months to avoid a build up at the bottom of your pond. 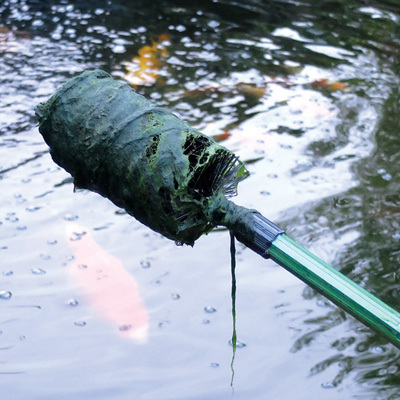 Vacuuming the bottom of your pond regularly is a great way to deal with the build-up of sludge. There are also sludge busting treatments that will help. There are also other ways that excessive nutrients can make their way into your pond. For example, if you have used garden compost to pot your pond plants, you will have added additional nutrients that are not included in aquatic soil. Or another case would be garden fertilizers running off into your pond. Algae thrives on excessive nutrients in the water so if you can not pin point what is causing an outbreak it may be worth investigating unexpected ways that excessive nutrients can make their way into your pond. There are a great number of treatments you can use to stop blanketweed growing in your pond. Different pond keepers find that different treatments work for them, because after all, every pond environment is different. In most cases treatments will need to be ongoing to stop the blanketweed from returning unless you can pin point and eradicate the exact cause. The first thing to do is to physically remove as much of the blanket weed as possible. This can be done with a blanket weed brush or a piece of wood. The idea is to twirl the blanketweed around the brush, remove it from the pond and discard. Once it has been removed you can begin to use your chosen treatment. Barley straw is the traditional and natural method to stop blanket weed from growing. It is an inhibitive method rather than a destroying method, so will be most effective when added in spring time at the start of the season before algae growth is at its strongest. Simply add the number of bales required for the size of your pond and over time they will decay in your pond. Take note not to add too many bales as this can cause problems. As the barley straw bales decay in your pond they will release hydrogen peroxide which prevents algae cells from forming. To help the barley straw decay, your pond needs to be well oxygenised and exposed to a certain level of sunshine. The combination of these factors will produce the hydrogen peroxide. A waterfall or a fountain would help to add oxygen. It may take 6-8 weeks for straw to become active when water temperatures are below 10 °C but only 1- 2 weeks when the water is above 20 °C. The bales will work best on the surface of the water (you may need to anchor in place to avoid sinking when the straw begins to rot) and near your moving water. Depending on your pond environment, it will take between three to six months for your barley straw to decay. After this time the straw will need replacing. It is worth noting that adding barley straw to an algae covered pond during prolonged hot weather may have the opposite of your desired effect and start to take oxygen levels out of the pond. If you like the sound of barley straw but would rather not have the bales floating on your pond surface, then the PondXpert Barley Flakes may be suited to you. They have been designed to work specifically underneath the surface of the water in a mesh bag (included with the flakes). Or the PonXpert Barley Straw Extract and the PondXpert ‘Throw ‘n Go’ Barley Balls are treatments you can easily add to your pond. PondXpert Blanketweed Beaters, Nishikoi Goodbye Blanketweed and PondXpert ‘throw ‘n Go’ Barley Balls are all pre-measured treatments that you can conveniently drop into your pond or filter each week. PondXpert Anti Blanketweed, Blagdon Barley Straw Extract and Oase String Algae control are all liquid treatments that you would measure and then add to your pond according to the instructions. The advantages of liquid treatments are that you can measure the exact amount of treatment needed for the volume of your pond and once the treatment has been added it mixes with your water rather than leaving something floating on your pond surface. Powdered treatments such as PondXpert Blanketweed Eliminator, Cloverleaf Blanket Answer and Nishikoi Clear Waters can be mixed with a bucket of pond water then pouring evenly over the surface of your pond. The advantage being that if Blanket Weed sticks to rocks around the edge of your pond or even on a waterfall, then you can put the mixed solution in a watering can and sprinkle it over the affected edges. If Blanket Weed has been a problem for some time, then investing in an electrical anti Blanket Weed devise may save you money over time. We offer two devises: the Blagdon Electronic Blanketweed Controller and the Velda T-Flow Tronic. The Blagdon Electronic Blanketweed Controller has a multi-frequency processor that will disrupt Calcium ions in the water which causes the algae cells to break up. Whereas the Velda T-Flow Tronic connects to the hose between your pump and filter then introduces copper ions to the water, which stops the formation of Blanket Weed and algae. Ramshorn snails can be a great introduction to your pond as they will eat your pond algae alongside any uneaten fish food! Ensure you introduce only Ramshorn snails as they are particularly good for algae. Although we do not currently offer Ramshorn snails online, they are usually available in our shop during summer months. Hopefully this blog will have given you some good pointers towards keeping a Blanket Weed free pond this summer. If you have any specific questions then please do not hesitate to contact a member of our team on 01642 370888 or email info@pondkeeper.co.uk. Receive internet-exclusive offers, discounts and previews by email. © Copyright Pondkeeper 2017. Pondkeeper is registered in England, Registration no. 5601027. Our VAT number is GB 875 4886 60.